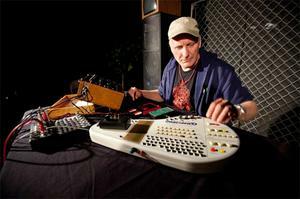 Joker Nies lives and works in Cologne, Germany, as a musician, sound designer, recording engineer, photographer and technical editor for the German Sound&Recording and Keyboard magazines. Since the ‘80s, Nies has experimented with all kinds of hardware- and software-based sound sources. During the early ‘90s, modifying the Omnichord became his initiation to what is known as circuit bending. Nies tailors his instruments to his needs and creates electronic devices with a broad range of sounds that he plays with great expression and musical gesture. He has worked and recorded with Gino Robair, Thomas Lehn, Alan Silva, Anna Homler, Seth Josel, Hans Tammen, Günther Christmann, Georg Wissel and many others throughout Europe, the U.S., South Africa, India and Mexico.